INS Savitri of Indian Navy, is on deployment off Seychelles and Mauritius in the Indian Ocean Region (IOR) from end November till early January 2010. Savitri is a Sukanya class Offshore Patrol Vessel (OPV) commissioned on November 27, 1990 and built by Hindustan Shipyard Limited. Savitri will operate in close coordination with the ships and aircraft of Seychelles Coast Guard (was formed in 1992) and the Mauritian National Coast Guard (was formed in July 1987). Savitri has a Chetak helicopter and Marine Commandos to carry out surveillance of Exclusive Economic Zone of Seychelles and Mauritius including anti piracy operations. 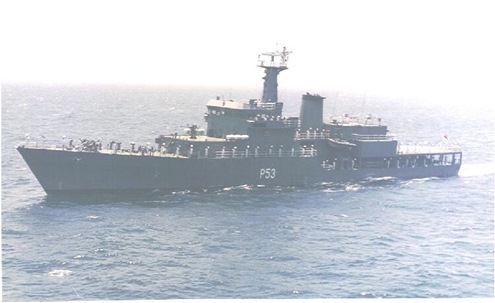 Here is a photograph from Indian Navy of INS Savitri (P 53).